Alco Scaffolding have staff trained to work in confined spaces and drive powered access vehicles; no project is too big or too small for our team. 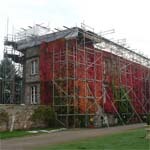 Our team have experience working on tall buildings (such as Carlisle Civic Centre), listed buildings (such as Appleby Castle) and small projects for domestic customers, jobs only made possible by our scaffolders having over 25 years combined experience. Alco Scaffolding's efficient and committed staff work with our clients throughout their projects to help them hit their deadlines and work within their budget. Our hire periods are always flexible to suit your needs. All our scaffolders are CITB trained, ranging from apprentice to advanced levels, and we are dedicated to training the next generation of scaffolders. 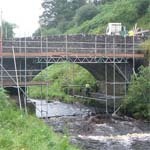 We use independent tube and fitting scaffolding which is continually maintained and upgraded. Our modern fleet is always expanding and includes 7.5, 17 and 18 tonne vehicles. We can work with the Scafftag Safety Management System and/or provide sign off certificates. We can also provide risk assessments or method statements if required. 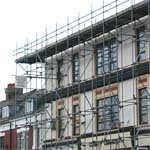 Alco Scaffolding are one of few companies in the area able to provide safety netting. FASET (Fall Arrest Safety Equipment Training) trained staff can fit safety netting to provide reliable protection from injury by falling from height or from falling debris. 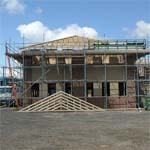 So for your next scaffolding project do not fail in contacting us for a FREE estimate and/or site visit. Speak to Ross on 07768 808127.